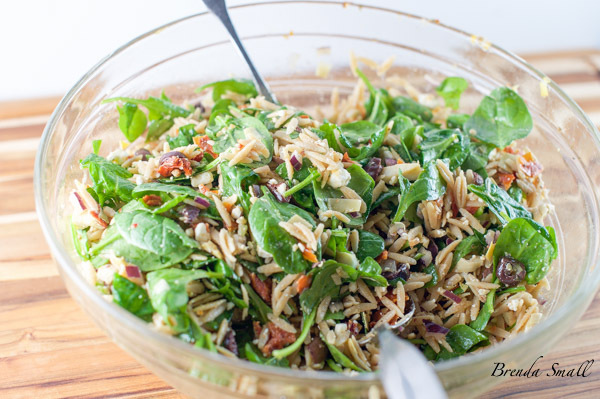 This awesome Greek style Mediterranean Orzo and Baby Spinach Salad with Sun-Dried Tomatoes, Kalamata Olives and Artichoke Hearts will win you rave reviews! Everyone I have prepared it for has loved it and requested the recipe. I’ve made this delicious salad 4 or 5 times in the last several weeks with great success each time. You could add grilled, sliced chicken breasts or steak, or cooked shrimp for an entree salad that will put a smile on your family’s face. I had a request to make it for Passover last Friday which my nephew, Justin, and his wife, Nicole, hosted. They have two adorable little girls, Julia and Sadie. I’ve been hosting the Small family Passover since all of our kids were young, but sitting there on Friday night at the Passover table surrounded by all of the positive energy these kids provided, made me realize that holidays in the Small/Wylie/Gibson/Davis/Wallace/Hearst family are now all about the next generation and their children! I guess it is now time to hand Passover over to the younger generation. Nicole and Justin, count us in for next year! A cute story about Joel’s mother, Helen. Last weekend was her 95th birthday. We had a family get together on Saturday night at my sister-in-law and brother-in-law, Cherie and Neal’s home. 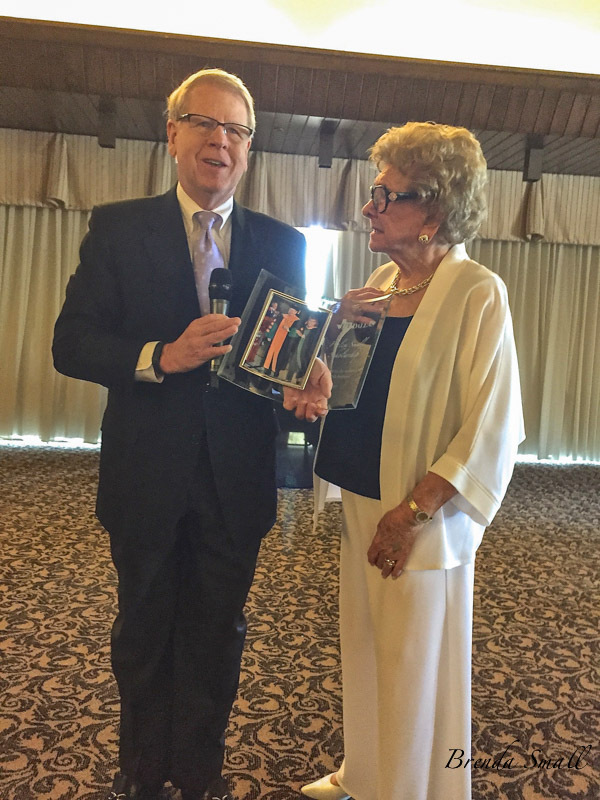 On Sunday, we had a brunch at Bent Tree Country Club for 160 of her closest friends and family. For those of you who know Helen, she is an amazing woman who completed her Undergraduate Degree at age 87, then received her Master’s Degree in Psychology at the ripe old age of 90. 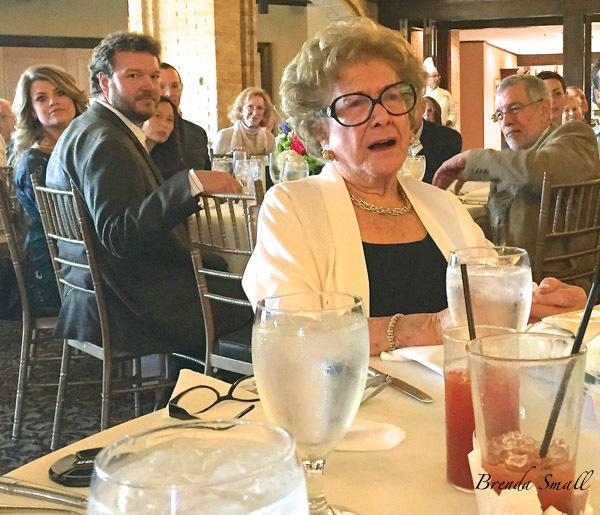 Since education is obviously her thing, her 3 sons and daughter-in-laws endowed the Helen Small Scholarship fund in honor of her 95th Birthday. As you can see, she was thrilled! When the announcement for the Helen Small Scholarship Fund was made. Dr. David Daniels, president of The University Texas at Dallas, presented her with the scholarship. As you can see, she was sooo excited!! Also there from the University was her mentor, Pagett Gosslee. Many thanks to both of you for making it such a special day for her. “Thanks” Pagett for the photos! Now, back to the original story. (Sorry I got carried away, but I am so proud of my mother-in-law!) Our friend, Libby Mundy from Nashville, came in for the weekend. 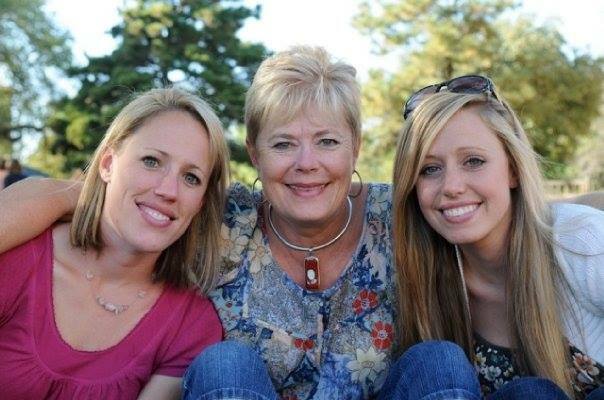 Mom, Libby, Zach and I were at lunch one day. We started discussing what we were going to take to Passover the next Friday night. I mentioned this salad, which I had made for a family dinner the night before. Mom promptly informed me that she “did not like it“! As everyone else disagreed, I brought it any way. I guess when you’re 95, you can say what you want. I did notice that she had a rather large serving on her plate at Passover. 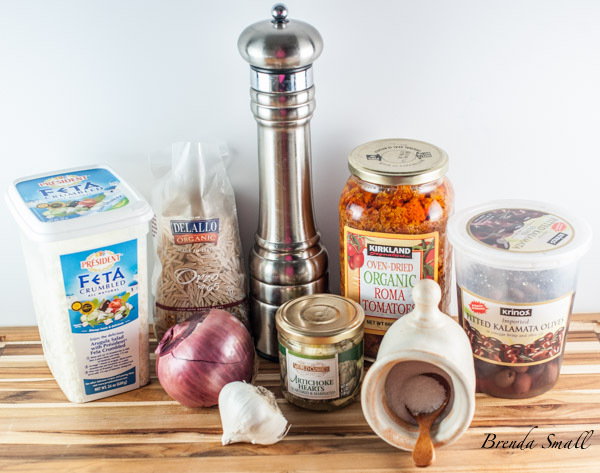 These are the ingredients you will need to prepare this Greek style salad. 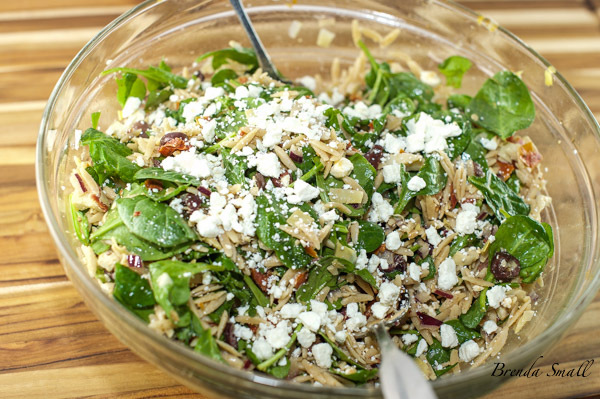 I have tried making it with both regular Orzo and whole wheat Orzo. I definitely prefer the whole wheat Orzo. 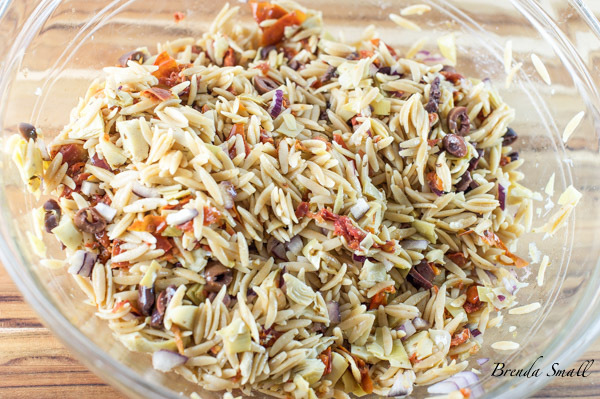 I think it adds a slightly nutty flavor and has a bit more texture than regular Orzo. I purchase the Feta cheese, Organic Roma Tomatoes, Kalamata Olives and Marinated Artichoke Hearts at Costco. I also added 1/2-3/4 teaspoon Oregano (depending on how much Oregano flavor you prefer). The first few times I made the salad without the Oregano, I thought it was a little on the bland side. This is the Baby Spinach that has become a staple in my refrigerator. 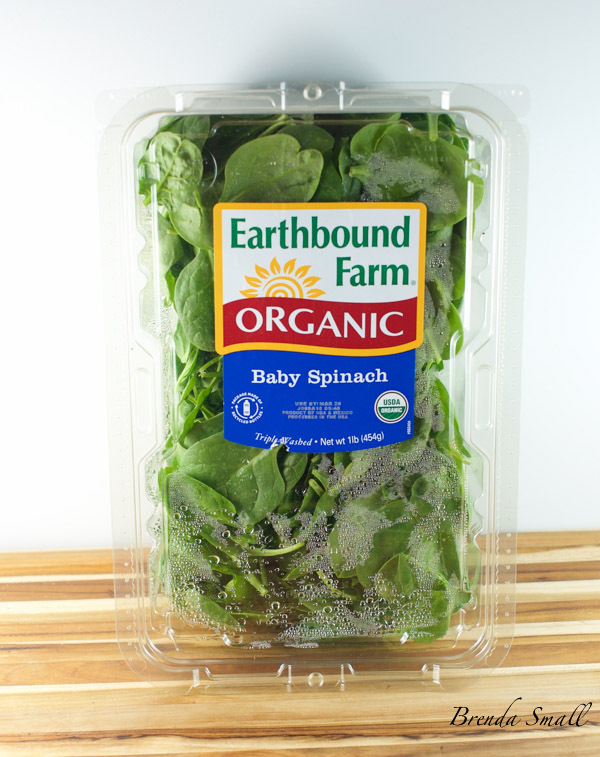 I can always come up with something to make with Baby Spinach…a salad, a side dish or even a soup. I also purchase this at Costco. I like to chop the Sun-Dried Tomatoes fairly small and thinly slice the Kalamata Olives as they are both a little on the tart side. 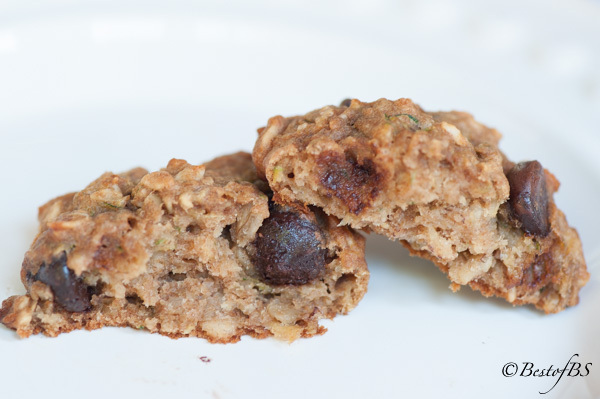 This is prepared with the Whole Wheat Orzo, thus the off white color. Also, I coarsely chop the Marinated Artichoke Hearts. Toss the ingredients until combined. Gently toss in the Baby Spinach. Toss in the Feta Cheese. Check for seasonings, and add Sea or Kosher Salt and Fresh Ground White Pepper to taste. You can either serve it in a large salad bowl as shown here, or you could mound it on individual salad plates and sprinkle a little Feta Cheese over the top of the salad. And…there you have it! A most awesome salad that is now one of my favorites! Cook the orzo according to the package directions, omitting the salt and butter or oil. When cooked to al dente, pour into a colander with small holes. Rinse with cold water and thoroughly drain. Cool. Drain artichoke hearts, reserving the marinade. Coarsely chop. 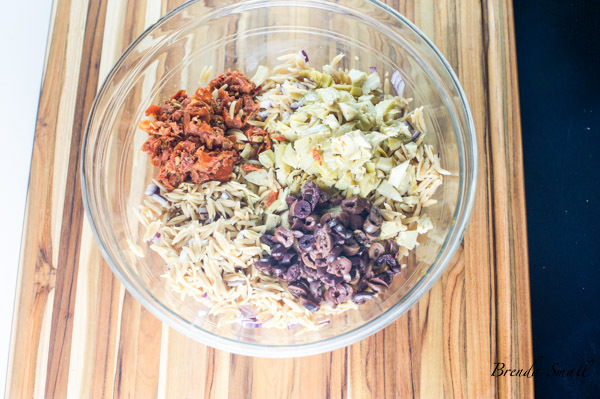 In a large salad bowl, toss together the artichoke hearts, sun-dried tomatoes, Kalamata olives, onion, garlic, and oregano. Toss in the cooled orzo. Add the spinach, the ½ cup Feta cheese crumbles and toss gently. Check for seasonings, and add salt and pepper to taste. If the salad seems too dry, add some of the reserved artichoke marinade. To serve, mound on individual salad plates and sprinkle with the remaining ¼ cup Feta cheese.